Hollingsworth in the Community - Ysgol Gymraeg Mornant - Hollingsworth Group (UK) LTD. Here is an invitation and letter we received from Ysgol Mornant, Picton thanking us for the support we gave them on a recent charity project. This was the school that Hollingsworth Group’s own Hadyn Hughes and Gaz went to as children. 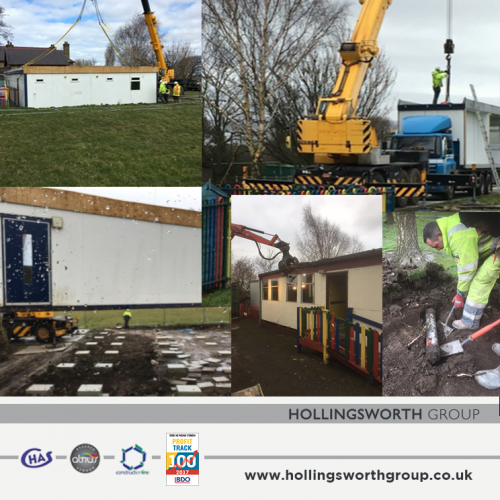 Hollingsworth Bros supported this charity by providing labour, plant and materials to demolish the old porta cabin, construct new pad foundations for the new cabin and also drainage and water connections following the installation of the cabins. Whilst on site they also helped the school unearth a time capsule that was buried in the year 2000 to celebrate the millennium.